A proudly Australian, independently owned family based business, Animal Dreaming Publishing is the perfect alternative to getting published in Australia. Being Australia’s leading hybrid publishing company that offers both assisted self-publishing and traditional publishing services, Animal Dreaming Publishing allows you to track and maintain control of your book through the entire publishing process, and confidently have a say in how the finished product will look and feel. A powerful option for Mind Body Spirit authors, Animal Dreaming Publishing will be more than happy to help you birth your novel, children’s book or general non-fiction manuscript into reality. 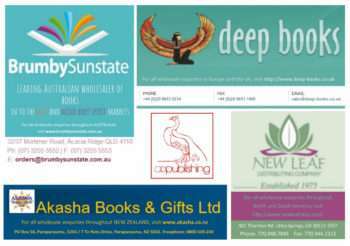 In conjunction with BRUMBY SUNSTATE in Australia and AKASHA BOOKS in New Zealand, both of which are leading spiritual and new age distributors in their own right, Animal Dreaming Publishing is proud to say we are committed to helping our authors build their profiles and improve the availability of their titles here and overseas. So much so, we are also proudly distributed internationally by NEW LEAF in the US (North and South America and surrounding territories) and DEEP BOOKS in the UK (which also distributes throughout Europe). Animal Dreaming Publishing’s imprints include – among others – reference books, children’s novels, spiritual and New Age titles, Mind/Body/Spirit titles, oracle cards, affirmation and inspiration cards, tarot cards and self-help and self-empowerment titles. If you are a registered business, or you own or manage a retail business that sells books, oracle cards and other printed products, and you would like to stock any of our ANIMAL DREAMING PUBLISHING titles – no matter where you are located within Australia, and you don’t have an account with Brumby Sunstate (our Australian distributor), we would be more than happy to have a member of our team contact you. To get started, though, we will need to establish you in our system, so please complete the form on the right.